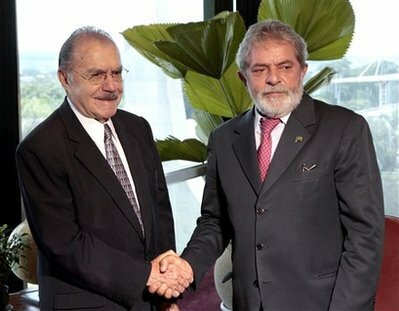 O presidente Sarney afirmou, nesta manhã, que a aliança do PT com o PMDB é solida e tem como grande articulador e fiador o ex-presidente Luis Inácio Lula da Silva. “O ex-presidente Lula é figura predominante dentro das articulações políticas”, declarou o senador. “Nós consideramos dentro do PMDB que a presença do ex-presidente Lula na política brasileira é fato decorrente da sua liderança nacional não é um evento ocasional de governo”, acrescentou Sarney. Sarney disse não ter, no momento, condições para avaliar a possibilidade de relações do assassinato de ambientalistas com a situação política decorrente da votação do Código Florestal. Observou, porém, que “é estranho que isso ocorra e ao mesmo tempo”. Ele declarou ainda que pessoalmente considera que os desmatadores não podem ser anistiados. “Nós temos que preservar cada vez mais as nossas florestas que são hoje muito importantes pára o Brasil”, concluiu. Nice thoughts going to use these immediately. Cool contribution,It is my opinion you have unquestionably fashioned a site I want to check back on daily. Thanks a lot. Smart piece,I feel you have unquestionably produced a site I want to come back to daily. Thanks a lot. Many thanks for today’s entry, I can’t say I agree exactly with it but I agree with it on the most part and I certainly applaud your effort in putting it so ably. Many thanks for your entry, seriously, can you sign up as a topic contributor for wikipedia because the current pages hosted there for our interest is quite frankly garbage. I can’t say I agree exactly with it but I agree with it on the most part and I wholeheartedly applaud your effort in putting it so clearly. Many thanks for this entry, I don’t quite agree exactly with it but I agree with it on the most part and I wholeheartedly applaud your effort in putting it so clearly. Pleasant article, I actually enjoyed glossing over it, keep up the hard work. I can’t help but think that this wedding will be one of the best things to happen of the recent years. Felicitations to the happy newlyweds and any body that doesn’t agree is a misery. I think that this wedding will be one of the best things to happen of the decade. Congratulations to the happy couple and any one that doesn’t agree is a misery. Pleasant page, I actually benefited from studying it, keep up all the good work. Many thanks for the entry, I don’t agree completely with it but I agree with it on the most part and I definitely applaud your effort in putting it so clearly. Thanks for the post, honestly, can you become a author for wikipedia because the current pages submitted there for our hobby is quite frankly next to useless. I can’t say I agree exactly with it but I agree with it on the most part and I wholeheartedly applaud your effort in putting it so succinctly. Fine piece of writing,I’m sure you have definitely built up a web site I need to read regularly. Thanks a lot. I certainly like your views. Fantastic contribution,It is my opinion you have for sure fashioned a blog I have to check back on routinely. Thanks a lot. I certainly like the sentiment. Cool page,It is my opinion you’ve clearly built up a website I would like to visit on a regular basis. Thanks a lot. Fantastic page, I genuinely benefited from reading it, keep doing the hard work. Now I’ve seen the Sixty Minutes program I think Armstrong is done for. After watching that 60 minutes episode I would bet Armstrong is finished. I think that this wedding is one of the best things to happen of the recent years. Congratulations to the happy couple and any one that doesn’t agree is a republican. I think that this wedding will be one of the best things to happen of the recent years. Best wishes to the happy couple and any one that doesn’t agree is a killjoy. I can’t help but think that this wedding is one of the best things to happen of the decade. Best wishes to the happy couple and any one that doesn’t agree is a killjoy. Very good post,I believe you’ve unquestionably produced a website I would like to check back on on the regular basis. Great stuff. Fantastic feature, I surprisingly had a good time reading it, keep up all the good thoughts. Fantastic post, I actually enjoyed reading it, keep up all the hard thoughts. Thank you for today’s entry, honestly, can you sign up as a topic writer for wikipedia because the current pages in there for our hobby is quite frankly next to useless. I don’t quite agree completely with it but I agree with it on the most part and I definitely applaud your effort in putting it so ably. Smart article,I do think you’ve undeniably put together a site I need to return to continually. Thank you. Enjoyable post, I genuinely enjoyed glossing over it, keep up the good work. Exceptional posting,I do believe you have emphatically fashioned an internet site I need to visit daily. Thank you. I certainly dig your views! Many thanks for the post, I don’t quite agree completely with it but I agree with it on the most part and I wholeheartedly applaud your effort in putting it so ably. I most certainly respect this post! Thank you for your entry, I don’t agree completely with it but I agree with it on the most part and I certainly applaud your effort in putting it so ably. Fantastic message,I do think you could have probably started a web page I must return to routinely. Great stuff. Thanks for the post, honestly, can you become a contributor for wikipedia because the current stuff submitted there for our hobby is frankly dross. I don’t quite agree exactly with it but I agree with it on the most part and I certainly applaud your effort in putting it so clearly. Pleasant page, I actually had a good time glossing over it, keep up all the hard thoughts. Grazie for your entry, honestly, can you sign up as a topic writer for wikipedia because the current stuff submitted there for our hobby is quite frankly dross. I don’t quite agree completely with it but I agree with it on the most part and I certainly applaud your effort in putting it so clearly. Since watching that 60 minutes episode you have to reckon Lance is going to struggle. Amazing write-up,I do think you’ve emphatically assembled a web site I wish to visit regularly. Thank you. Thank you for your post, honestly, can you sign up as a contributor for wikipedia because the current stuff hosted there for our interest is frankly drivel. I don’t agree completely with it but I agree with it on the most part and I wholeheartedly applaud your effort in putting it so clearly. Fun article, I genuinely enjoyed glossing over it, keep up the good writing. Thanks for today’s post, I don’t quite agree completely with it but I agree with it on the most part and I definitely applaud your effort in putting it so clearly.